I am in charge of organizing monthy activities for the woman's group at my church. This week we had a night all about Journaling and recording your personal history. I used it as a fun excuse to make more pom poms. 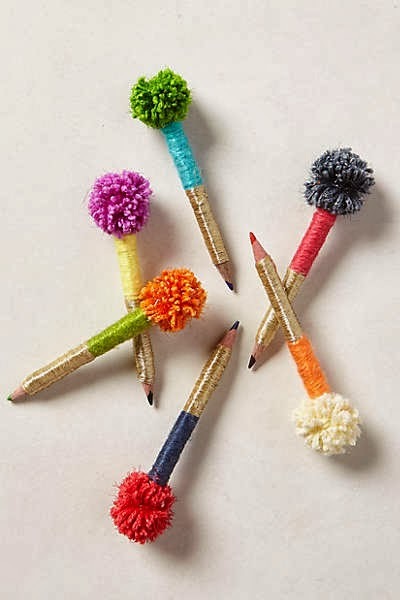 Inspired by the cute Anthropologie pom pom pencils I pinned on my Pom Pom Love page, I made up a whole bunch of them to give out as favors for the night. I simplified them a bit and used washi tape instead of wrapping the yarn around the pencil. Anyone know where you can buy shiny gold yarn? I might need to buy some of that. Now for the pom poms. Here's the fastest way I've found to make these little guys. Just take some yarn and wrap it around 2 fingers until it's nice and thick. Use the tip of your scissors to grasp a separate length of yarn and thread it between your fingers. Tie the yarn around the center. I find that if I wrap my thread around twice when I'm making my knot it will hold better when I cinch it. Slide your fingers out and cinch your knot tight and double knot it. Then cut the loops. and trim your unruly pom pom to the right size. and you've made one cute favor. I made 12 in about an hour, pom poms and all. I think that the anthropologie picture uses metallic gold embroidery floss. Or, at least, that would work too.